Snorkeling Panama City Beach | Flippers Tours & Rentals, Inc. There is a reason they call it the Emerald Coast, the panhandle of Florida, including Panama City Beach, Destin, Fort Walton & 30A has been blessed to have some of the most beautiful waters anywhere in the world and with the beaches being so easily accedes by so many in the southern states it has become a perfect geta-way for many beach lovers. I have been a local of Panama City Beach for 20 yrs now & being in the tourism business gives you the opportunity to mingle with a lot of folks, it always amazes me how many people are long time visitors of the beaches but have never experienced the bountiful opportunities for fun & relaxation that our bays have to offer. I have even talk to several PCB locals that have never been to Shell Island (our local treasure). I just wanted to take the time to make visitors & locals alike aware of some of the wonderful attractions & things to do in Panama City besides hanging out at the beach or playing goofy golf at coconut creek. First on the list of Things to do is explore Shell Island. With seven miles of un-inhabited beaches and an abounded amount of wildlife Shell Island is a great attraction for Panama City visitors and there are many ways to get there. My personal favorite way to get to Shell Island is by renting a pontoon boat. With the freedom to go at your own pace and the ability to find your own secluded spot pontoon rentals in panama city beach is a great way to experience what the Island has to offer. Our boats here at Flippers Dolphin Tours & Boat Rentals are clean and comfortable, they hold up o 12 and you don’t need any experience to operate. 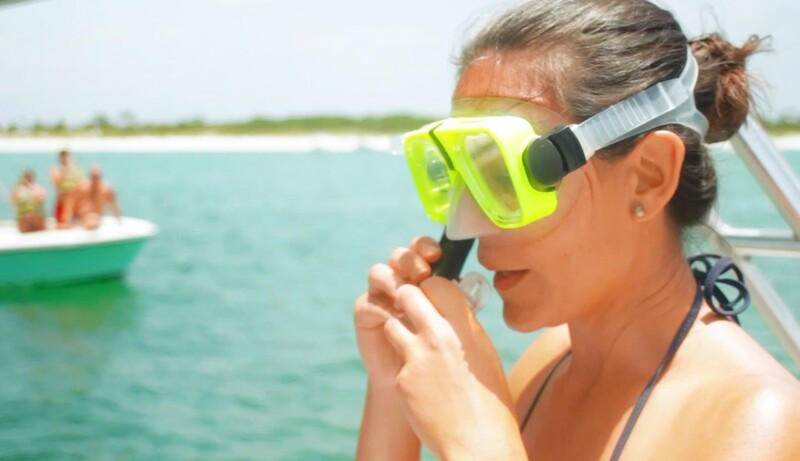 We also sell Snorkeling gear so that you can enjoy the 2nd best activity in PCB, Snorkeling the Panama City’s pass Jetty’s & St Andrews Bay grass flats. Many PCB visitors know about Snorkeling the Jetty’s at St. Andrews State Park but few have ever had the pleasure of exploring the Grass Flats behind Shell Island. The Flats are teaming with all sorts of sea creatures such as, puffer fish, sea horse, starfish, sand dollars, flounder, trout & the very interesting horseshoe crab just to name a few. If you are boating on the bay snorkel gear is a must. If you the more adventurous type then you should look into the Guided Jet Ski Adventure Tour. Its a fast paced 15 mile tour on waverunners around Shell Island. You will get to explore Shell Island & enjoy the bay & the Gulf of mexico. Dolphins are sure to be spotted on this amazing wildlife adventure. Jet Ski Tours have become on of Panama City’s most popular Thing to Do over the years. Its great for adults and children alike. If you want to spend time with the Dolphins & take advantage of the snorkeling our waters have to offer then I suggest the Private Dolphin tour / Snorkel tour by Boat. Our tour guides are USCG Captains and are keen to the movements of the Dolphins. We provide the Snorkel Gear and the Captains can accommodate any skill level of snorkelers. Swimming with Dolphins is one of the Best Attractions for Families in Panama City Beach & if you have never gotten to experience this life changing opportunity then you are missing out. Whatever you decide – Snorkeling, Dolphin Tours, Jet Ski Rentals or Pontoon Boat Rentals Flippers Boat Rentals & Dolphin Tours wont disappoint. So give us a call and let our friendly staff assist you in finding the right activity in Panama City Beach for your family. Posted in Dolphins, Jet Ski, Panama City Beach, Uncategorized and tagged activities, boat rentals, boat tours, bottlenose dolphins, dolphin, dolphins, panama city beach, shell island, snorkel, Snorkeling, Things to do by flippers. Bookmark the permalink.